In the last few years, there has been potential development in the medical sector, thanks to which, the U.S. knee implant market is anticipated to gain traction in the next few years. The rising initiatives being taken the key players for creating an understanding among the players regarding the advantages of knee implants are anticipated to support the growth of the market in the near future. In addition, the rise in the use of 3D technology is predicted to ensure the growth of the market in the next few years. 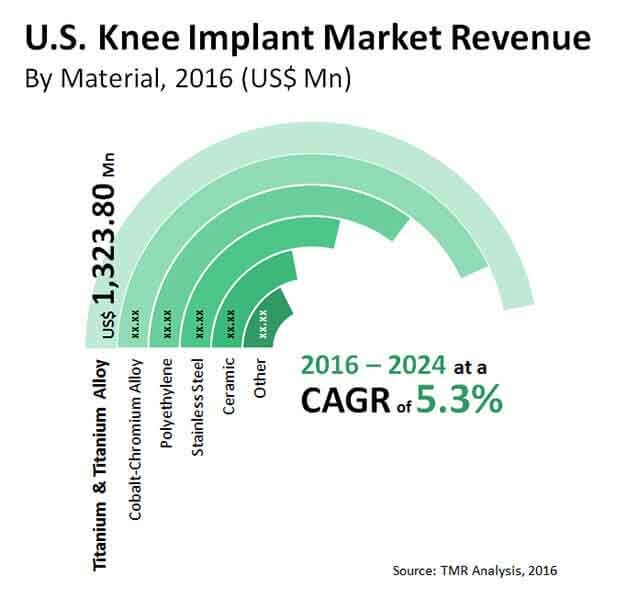 As per the study by TMR, in 2015, the U.S. market for knee implant was worth US$4.3 bn and is predicted to reach a value of US$7.0 bn by the end of 2024. The market is predicted to exhibit a 5.30% CAGR between 2016 and 2024. The rising developments and research activities in the medical industry are predicted to attract a large number of players, thus supporting the growth of the U.S. knee implant market in the coming years. The high rise in the geriatric population and the growing prevalence of several degenerative disease are further predicted to ensure the development of the overall market in the next few years. In addition to this, the presence of advanced healthcare infrastructure in this region and the rise in the awareness among people related to the availability of knee implants are the important factors that are projected to enhance the growth of the market over the next few years. On the other hand, the U.S. market for knee implants is predicted to face several challenges in the market, which might curtail the growth of the market in the near future. The high cost of surgery and implants and the lack of awareness among people regarding knee implants are predicted to restrict the market growth in the near future. Nonetheless, the advent of new products and the growing demand for minimally invasive surgeries are estimated to encourage the development of the knee implants market in the near future. Rising Research Activities to Encourage Growth of Knee Implant Market in U.S. The U.S. market for knee implants has been classified on the basis of geography into the South Atlantic, the Mountain, the Pacific, the South Central, the Midwest, and the North East region. Among these, the Midwest region is expected to witness high growth in the coming few years, owing to the presence and rise in the number of ambulatory surgical centers. In addition to this, the increasing focus on new and advanced technologies is likely to enhance the growth of the market in the next few years. Also, the increasing pool of patients and the rising number of manufacturers and the enhancement of distribution network is projected to support the development of the U.S. knee implant market in the next few years. The U.S. market for knee implant is extremely consolidated in nature with a few players holding a large share of the market. This market is expected to witness a high level of competition among the key players and is likely to rise substantially in the coming few years. Also, the rise in the number of players is expected to rise substantially over the next few years, thus enhancing the competitive environment of the market in the coming few years. The key players engaged in the knee implant market across the U.S. are OMNIlife science, Inc., MicroPort Scientific Corp., DJO Global Inc., Johnson & Johnson, Arthrex, Zimmer Biomet Holdings Inc., Exactech Inc., B. Braun Melsungen AG, Stryker Corp., ConforMIS, and Smith & Nephew. This report on knee implant market studies the current as well as future prospects of the market globally. The stakeholders of this report include companies and intermediaries engaged in the manufacture and commercialization of various implantable medical devices and products as well as new entrants planning to enter this market. This report comprises an elaborate executive summary along with a market snapshot providing overall information of various segments and sub-segments considered within the scope of the study. This section also provides the overall information and data analysis of the U.S. knee implant market with respect to the leading market segments based on major products, implant materials utilized, end-users, and geographies. The market overview section of the report explores the market dynamics such as drivers, restraints, and opportunities that currently have a strong impact on the knee implant market and could influence the market in the near future. Market attractiveness analysis has been provided in all the sections of the report in order to explain the intensity of competition in the market across different products/materials/end-users/geographies. The competitive scenario among different market players is evaluated through market share analysis in the competition landscape section of the report. The section also includes completion matrix that analyzes the competition among some of the top global players operating in the market. The report further analyze knee implant business challenges, raw material and inventory procurement scenario in the U.S., knee implants market opportunity/demand distribution, by state, pricing analysis and knee implant supplier life cycle management. All these factors would help market players to take strategic decisions in order to strengthen their positions and expand their shares in the global market. The U.S. knee implant market has been studied based on major product segments, material segments, their end-users, and regional markets. Based on product type, the U.S. knee implant market has been categorized into three major segments: total knee reconstructive implants (further sub-segmented into fixed bearing implants, mobile bearing implants, medial pivot implants and others), partial knee reconstructive implants and revision knee reconstructive implants. Based on material, the U.S. knee implant market has been categorized into five major segments: stainless steel, Cobalt-Chromium alloys, Titanium and Titanium alloys, polyethylene, ceramics and others (uncemented implants, Tantalum, Zirconium etc.). Based on end-user, the U.S. knee implant market has been categorized into three key segments: hospitals, specialized orthopedic clinics and ambulatory surgery centers (ASCs). Geographically, the implantable medical devices market has been segmented into six regions across the U.S.: Pacific region, mid-west region, mountain region, south-central region, south-Atlantic region, and northeast region. The market for these segments has been extensively analyzed based on their utility, effectiveness, sales, and geographic presence. Market revenue in terms of US$ Mn and market volume in terms of units for the period from 2014 to 2024 along with the compound annual growth rate (CAGR %) from 2016 to 2024 are provided for all segments, considering 2015 as the base year. The report also profiles key players operating in the U.S. knee implant market based on various attributes such as company details, SWOT analysis, strategic overview, financials, and business overview. Major players profiled in this report include Johnson & Johnson, Zimmer Biomet Holdings, Inc., B. Braun Melsungen AG, Exactech, Inc., DJO Global, Inc., Stryker Corporation, ConforMIS, Smith & Nephew plc, OMNIlife science, Inc., MicroPort Scientific Corporation and Arthrex.